Missing Big Bang on your television? Don’t fret. MTV Asia presents Seoul Sunday, a weekly show featuring your favorite Korean artists. Seoul Sunday has music videos, countdown specials, concerts and exclusive interviews. 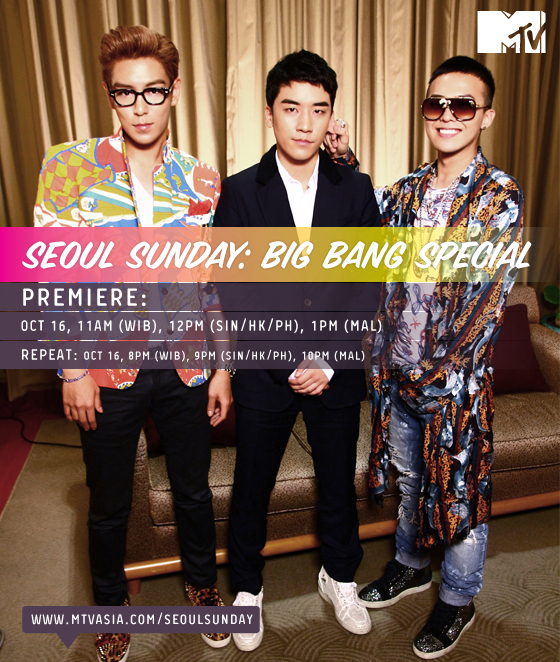 And for you VIPs out there, on Sunday, October 16, MTV Asia will be airing Seoul Sunday:Big Bang Special. The show starts at 12 noon (Manila Time). There will be a repeat on the same day at 9pm. Be sure to tune in! This entry was posted in News, Television and tagged Big Bang, MTV, Seoul Sunday, television, TV. Bookmark the permalink.